Synthetic peptide within Human CD44 aa 150-250. The exact sequence is proprietary. Recombinant Human CD44 protein (ab114154) can be used as a positive control in WB. TF-1 cell lysate or human urinary bladder tissue. Our Abpromise guarantee covers the use of ab51037 in the following tested applications. WB 1/5000. 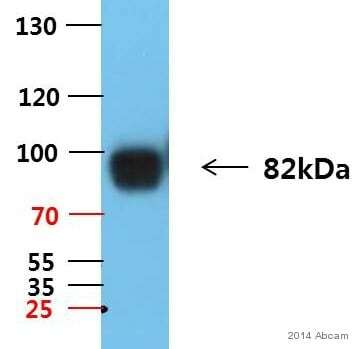 Detects a band of approximately 82 kDa (predicted molecular weight: 82 kDa). ab51037 used at a 1/200 dilution (red) to detect CD44 in human MDA-MB-231 cells by Flow Cytometry. The secondary used was a Pgoat anti-rabbit IgG (Alexa Fluor® 488) polyclonal used at a 1/2000 dilution. Isotype control (black): Rabbit monoclonal IgG (ab172730). Unlabelled control (Blue): Cell without incubation with primary antibody and secondary antibody. Immunohistochemical analysis of paraffin-embedded human pancreatic cancer tissue labeling CD44 with ab51037 at 1/100 dilution followed by goat anti-rabbit IgG H&L (HRP) (ab97051, 1/500). The sample was counter stained with hematoxylin. 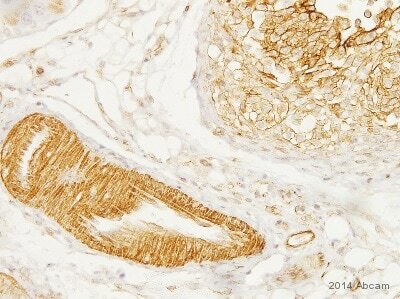 ab51037 (1:100) showing positive staining in human Breast carcinoma tissue. Immunohistochemical analysis of paraffin-embedded human tonsil tissue labeling CD44 with ab51037 at 1/100 dilution followed by goat anti-rabbit IgG H&L (HRP) (ab97051, 1/500). The sample was counter stained with hematoxylin. Immunohistochemical analysis of paraffin-embedded human skin tissue labeling CD44 with ab51037 at 1/100 dilution followed by goat anti-rabbit IgG H&L (HRP) (ab97051, 1/500). The sample was counter stained with hematoxylin. Immunohistochemical analysis of paraffin-embedded human cervical cancer tissue labeling CD44 with ab51037 at 1/100 dilution followed by goat anti-rabbit IgG H&L (HRP) (ab97051, 1/500). The sample was counter stained with hematoxylin. ab51037 (1:100) showing positive staining in human Glioma tissue. 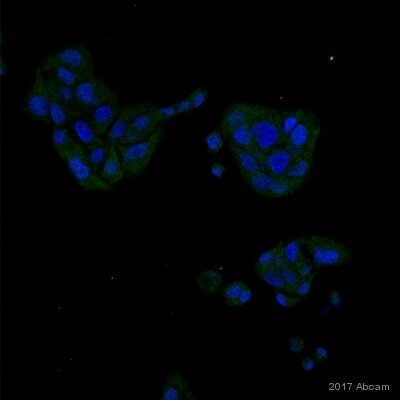 ab51037 (1:100) showing positive staining in human Thyroid gland carcinoma tissue. Publishing research using ab51037? Please let us know so that we can cite the reference in this datasheet. Could you please let me know is the CD44 antibody (ab51037) recognize the ALL CD44 isoforms or a specific variant? According to SwissProt, the immunogen range indicates it can detect most isoforms, excluding only isoform 2 and 19. Thank you for taking the time to contact us. I am sorry to hear you have had difficulty obtaining satisfactory results from this antibody in mouse. I would like to reassure you that this antibody is tested and covered by our 6 month guarantee for WB and Human samples. In the event that a product is not functioning in the tested applications and species cited on the product data sheet (and the problem has been reported within 6 months of purchase), we will be pleased to provide a credit note, free of charge replacement or refund. I am sorry we are regrettably not able to guarantee this antibody in mouse. Previous results from this species have been inconsistent with this antibody, and so it is not listed as a tested and guaranteed species under 'reacts with'. There are many isoforms of the CD44 protein. I have checked the alignment of the immunogen with several of these isoforms from mouse, and the alignment is quite low at no higher than 63%. This probably explains why the antibody is not detecting in your experiments, and why previous testing has been inconsistent. Leider handelt es sich bei diesem Produkt um einen Antikörper, der sich noch in dem ursprünglichen Zellkultur- Überstand befindet: dies macht eine Messung der Antikörperkonzentration aufgrund der verschieden vorhanden Proteine unmöglich.